Currently there are more than 400 vehicles in the game. They are divided into 5 classes – Self-Propelled Guns, Tank Destroyers, Light, Medium and Heavy Tanks. But within the same class there might be completely different vehicles: the Maus and AMX 50 B as Heavy Tanks, the E-50 Ausf. M and TVP 50/51 as Mediums, the Grille 15 and T110E4 as TDs, etc. These vehicles significantly differ in terms of their tactical use in battle. As a result, it may be difficult for players at times to choose the vehicle they are interested in, as well as understand how to play it. 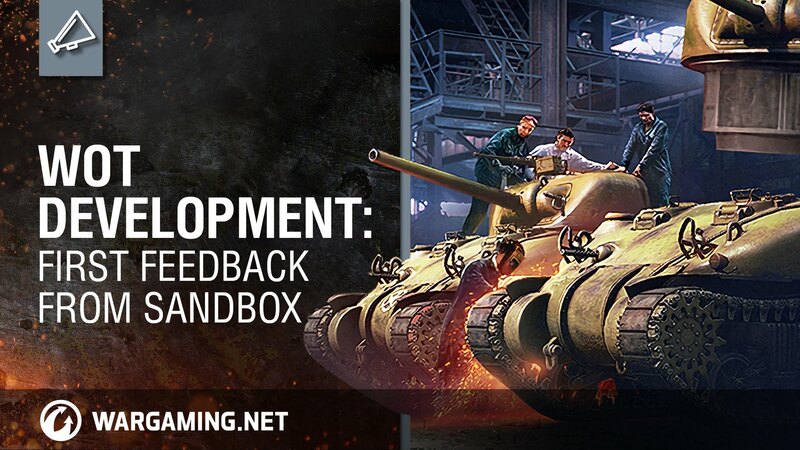 To solve this issue, the system of tactical roles in WoT is being worked on currently. Our long-term goal in testing the role system in Sandbox is to create a system of interaction between the various tank roles in battle. In the short-term, we are aiming to adjust vehicles balance, fix obviously imbalanced tanks and give our players the opportunity to test the vehicle-role system in battle. For the role system, it’s planned that there will be seven roles, with Hybrid vehicles (i.e. tanks that have two roles) also being a possibility. At the same time, hybrids will be designed in such a way that their effectiveness in a specific role will be more limited, when compared to a single-role tank. Cavalry: Cavalry will mostly be represented by medium tanks – they will be mobile and relatively armoured vehicles. Their key traits will be their good manoeuvrability and stabilisation, as well as their narrow view range. Cavalry vehicles are designed to deal with quick team breakthroughs. They will be particularly effective in close quarters with heavily armoured vehicles, as their manoeuvrability and rate of fire will allow them to confidently “circle” and hit vulnerable places on enemy vehicles. Typical representatives of cavalry tanks are Soviet and Chinese high-Tier medium tanks. Currently on the Sandbox server, cavalry are represented by the following vehicles: the T-62A, E-50 Ausf. M, Object 140, Object 430, and the 121. Fire Support Vehicles: Typical examples of fire support vehicles are those with a good view range, effective armament and decent mobility. At the same time, these vehicles don’t have good armour. The main goal for these vehicles is to cause damage to opponents from the second line of battle – close range battles are not the best idea! It’s possible to determine the most effective battle distance for a specific vehicle by looking at its armour penetration value – the higher it is, the greater the distance at which the tank can battle. Representatives of fire support vehicles include: the AMX 50 B, M48A1 Patton, Leopard 1, T57 Heavy Tank, Bat.-Châtillon 25 t, AMX 30 B, FV4005 Stage II, Centurion Action X, TVP T 50/51 and the STB-1. Ambush Vehicles: The role of ambush vehicles is the most common for Tank Destroyers. The basis of the gameplay for this type of vehicle is using camouflage and firing from cover. Battle distance is determined by the concealment of the vehicle and the survival rate and effectiveness of these vehicles will directly depend on the player’s skill using this parameter. It’s a pretty difficult class to play, that will only fully open up under the control of an experienced player, that is tactically competent and capable of keeping in mind a number of factors. In addition to stealth, these vehicles stand out with their high firepower and excellent armour penetration. Ambush vehicles are not meant for battles at close distance. Examples of ambush vehicles: Object 268 and Grille 15. Scouts: Scouts are presented in the game as the Light tanks class. These vehicles have the highest view range and excellent manoeuvrability.The final realisation of the vehicles of this type is now being discussed and worked on. Representatives of scouts-vehicles: the T-54 ltwt, RU 251, and T49. Assault Tanks: Assault tanks are mobile heavy tanks, with good front armour and are the main striking power of a team in battle. The guns on vehicles of this type are suitable for battles at close and medium distances and have good values of rate of fire, armour penetration and alpha damage, but suffer from poor stabilisation and accuracy. The goal for these vehicles in battle is to keep control of key points on the map and engage in attacking actions. Typical representatives: ?110?5, IS-7, ?110?4, 113. Dreadnoughts: Well-armoured vehicles with lots of hit-points. They play the role of “team’s shield”, by soaking up the opponent’s damage, however they are slow and have poor manoeuvrability. In a battle at close distance they can be “circled“ by more mobile opponents. These tanks will perform best in pushing the line, shielding allied vehicles, or in defending strategic positions. The list of heavy tanks: ? 100, ?110?3, IS-4, Jagdpanzer E 100, Maus, Type 5 Heavy. Artillery: The rebalanced SPG class. On the Sandbox server, vehicles of this class have a completely new role: instead of causing damage to individual tanks, now they rely on teamwork. Stunning an opponent with shock reduces their combat effectiveness and makes them more vulnerable to allied fire. Nevertheless, the ability to cause damage still remains – due to the increased radius of fragment dispersion, SPGs can hit more enemies. The most effective tactic will be firing at groups of enemy tanks, causing damage and stunning several vehicles at the same time. The development and implementation of the role system aims not only to clarify tank roles (by dividing and describing vehicles by their behaviour in battle), but is planned as a way to make battles more interesting and diversive. Adjusting this system implies giving vehicles unique features in order to give specific roles to vehicles. Next Entry Tank Tuesday – What Makes you Happiest?